Discussions Magazine Music Blog: An EXCLUSIVE Interview with GENE's Matt James! An EXCLUSIVE Interview with GENE's Matt James! Nearly 20 years ago, Oasis and Blur may have won the headlines, but Gene personified what the Britpop scene was all about – a band from the UK creating a sound that was melodic, sharp, and distinctly (and proudly) British, yet still smart enough to appeal to listeners – and dreamers - who lived hundreds and thousands of miles outside of London. Like The Kinks, The Jam and The Smiths before them, Gene created defiantly British music that was both personal AND universal. Vocalist Martin Rossiter may have been singing about something that was inspired by a late foggy night in London, but his words reached out and touched listeners emotionally, drawing them into a world where feeling was just as important as melody. . Gene appealed to music fans that were searching for something more meaningful than a Union Jack patch for their parka and this Britpop quartet fit the bill perfectly. The band’s roots stretched back to the late ‘80s when drummer Matt James and guitarist Steve Mason were members of a band called Spin (previously known as The Go Hole). With singles released in ’90 and ’91, the band were gaining traction and building their fanbase when tragedy struck and the band was involved in a terrible road accident that left member John Mason (Steve’s brother) with a serious head injury. When it came time to decide on the band’s future, only Matt James and Steve Mason chose to continue creating music together. The duo brought in bassist Kevin Miles and began their search for a vocalist. Before long, in walked Martin Rossiter and the band was complete. But with the changing of the guard and a different musical approach, the band dropped the name Spin and Gene was born. 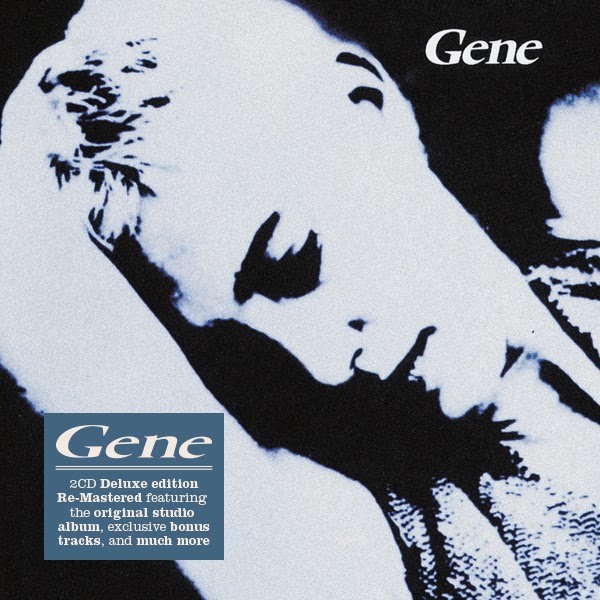 By 1994, Gene released their first independent single “For The Dead”/”Child’s Body” and immediately received a lot of attention in the press. Their second single “Be My Light, Be My Guide”/”This Is Not My Crime”/”I Can’t Help Myself” was released later in the year and its success garnered them attention from major record labels. Signing with Polydor, the band set about recording their debut. The album, Olympian, was released in 1995. The singles “Sleep Well Tonight” and “Haunted By You” brought them further attention and Gene became the talk of the town. With a series of successful tours and loads of press, the band could do no wrong. 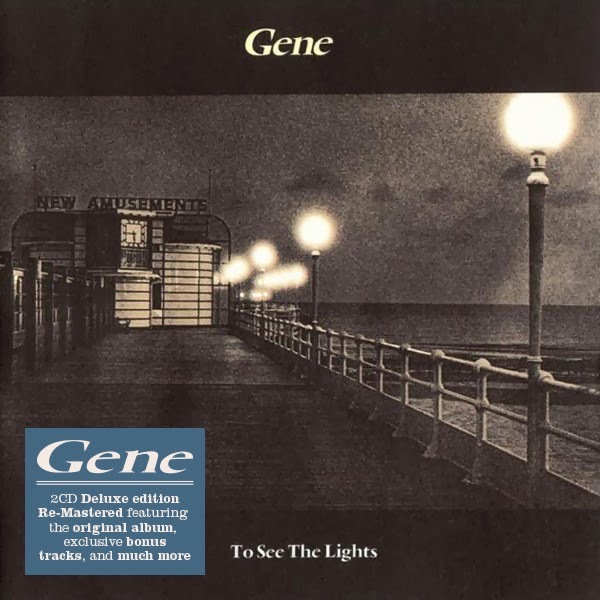 Often unfairly compared to The Smiths, Gene were creating timeless guitar Pop that has continued to sound as fresh and exciting as it did when it was first released. The band released a B-sides collection, To See The Light (1996) followed by the albums Drawn To The Deep End (’97) and Revelations (’99). 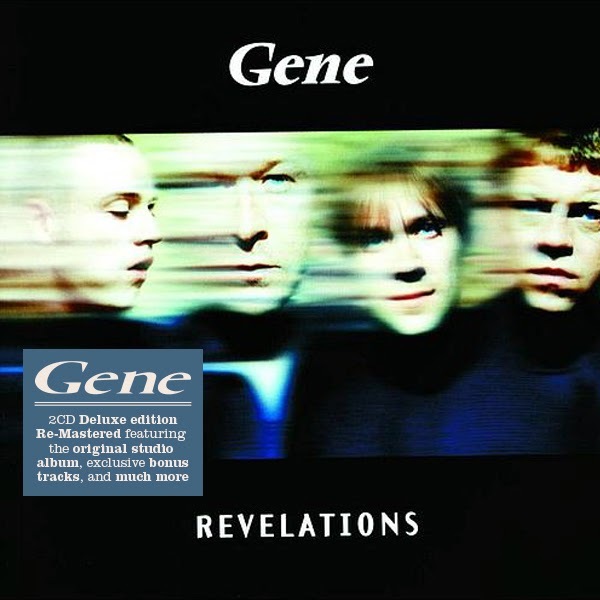 Though their music was still vital and adored by their ever-growing fanbase, Polydor cut ties with Gene and the band released a live album independently in 2000. Once they were free of the restraints of their major label, they released one of their finest albums, Libertine, on their own label in 2001. However, the band realized that they had achieved everything they had set out to do and decided to split up in 2004 while still at the height of their powers. With a catalog of classic albums and singles behind them, the four members of Gene left behind a catalog of great music that has stood the test of time. Now, a decade after they last played together, Edsel Records have just released deluxe expanded two CD reissues of their four studio albums and the To See The Lights compilation, each filled to the brim with non-album tracks, demos, live and other unreleased recordings. The albums themselves are worth the price of admission alone, but the bonus material makes each release absolutely essential. Stephen SPAZ Schnee: Gene was formed when your previous band, Spin, split up. Spin had already released an album and were gaining popularity before a terrible crash sidelined the band. What were your thoughts during this difficult time between bands? Were you keen to get right back into the music scene or were you hesitant after what had happened with Spin? MATT JAMES: What happened to Spin and specific members of band and crew was tragic. It effected different members in different ways...Steve and I became even more determined to fight on with the band. Lee the singer immediately wanted to stop and John was sadly too badly injured to do anything for many years after. We already had a record deal so we had support to keep promoting the newly released Spin record. It was a sad time. SPAZ: How did you hook up with vocalist Martin Rossiter? Did you know him during your days with Spin? MATT: We didn't know him at all but we needed a new singer for Spin and literally used to scour indie clubs and gigs for cool looking chaps. One night in the Camden Underworld Steve and I clocked Mart and Steve asked him if he could sing...to which he said nowt but produced a card that said 'Martin T Falls...soothsayer to the rich and famous' We asked him to come to a rehearsal. He had cards to suit every chance meeting. My fave was "Martin Rossiter...Consultant Psycho Killer...no job too small"
SPAZ: How did you come to choose the band name Gene? MATT: There was a lot of stories we made up about it, but in actual fact I had a friend who used to be in a band called Jean and Steve's mum is called Jean. I suggested the Gene spelling change as was an interesting multi-meaning word...it grew with us. SPAZ: Were you surprised that the band immediately attracted the attention of the press? And were you concerned that their early support would wane quickly? The British press has been known to build up and knock bands down rather quickly, sometimes even before the release of a debut album! SPAZ: How was working in Gene different from Spin? SPAZ: The band was immediately compared to The Smiths but Gene seemed to be influenced by a lot more than just Morrissey and Co. Which artists influenced yourself and the band Gene the most? MATT: Martin liked an odd mix of classical, hymns and Dance/Pop music but he was a Smiths fan, too. He's really into music in its notational, classic form as well as pop music. Me, Kev, and Steve were into the Rock heroes like The Who, Stones, Beatles, Small Faces...but I would say the biggest influence on the Gene sound was The Faces and Big Star. When Steve started to riff like Ronnie Wood, he really found something of his own. In Ronnie's loose style, but more melodic. He also loved Hendrix’s “Wind Cry's Mary type playing and created his own version of that style. Taking influences and moving his own music forward. Kev's heroes are Ronnie Lane and Macca (Paul McCartney). I came from the Punk era but my fave bands were the more melodical Punk bands like The Stranglers. We all loved melody. I never massively liked the Pistols but The Clash and Stranglers did it for me. I liked Reggae too, brought on by The Clash being into it. 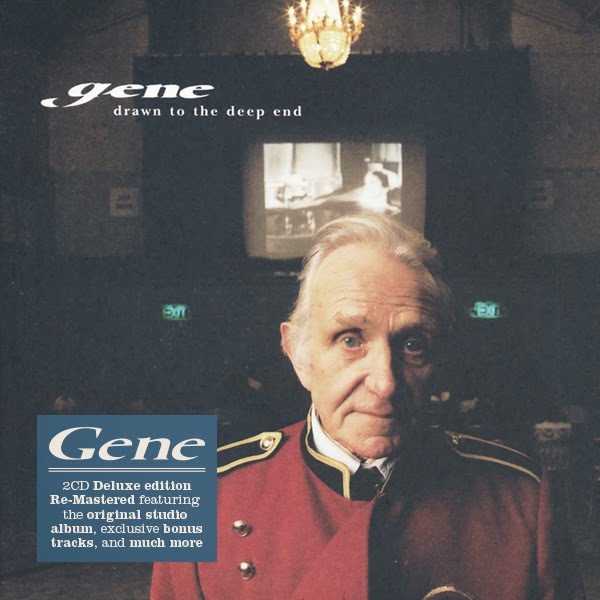 SPAZ: Perhaps one of the most prolific bands of the so-called Britpop-era, Gene seemed to have at least two albums worth of material, with many quality tracks used as b-sides. With such a wealth of great material, was it difficult to choose what songs would make the album and which ones would be b-sides? MATT: I think by the time songs have been though the rehearsal forum and been worked up to the best they can be, the resulting recording process lets you know which ones are best for the record. Some fly and take on new life - others don't quite get there. They need more work or another path and their time is not now! Having said that, I think we could have made Olympian stronger as a commercial worldwide product by not putting lots of great material on To See The Lights... but we were trying to be good to the fans. SPAZ: What are your thoughts these days on your 1995 debut album, Olympian? SPAZ: The following year, you released the compilation To See The Lights. Obviously, there were Smiths comparisons there since many compared the album to Hatful Of Hollow. While the plus side meant that the comparisons may bring in some new fans, there was also the possibility of Gene losing their own unique identity. Were those comparisons getting old by this time? MATT: It pissed us off as to us it was so abundantly clear that the music itself wasn't anything like The Smiths. In a way it was like we were being mugged of our true identity by a complete falsehood. But I understand how these things get talked about and then people stop listening objectively. I don't think Martin's vocal melodies were Morrisey or Smith's-esque either. I think there was just one or two inflections that he did in the early days that gave journo's something to pick away at. And it stuck! Compared to...say...Brett Anderson (Suede) being hugely influenced and 'inflecting' like Bowie or Matt Bellemy by Radiohead/Buckley. IMO, these guys are more like their heroes than Mart, but Mart got it so much worse... He took it well, though. You've got to be thick skinned or you might as well just forget wanting to be a successful band. I'm happy to say that these criticisms didn't change our creative process in any way. SPAZ: How do you feel about To See The Lights these days? MATT: Maybe one or two of the live tracks are unnecessary as it's a long record... but some killer tunes on there. “I Can't Help Myself,” “Sick Sober,” “To See The Lights” itself... It's the home of many band and fan Gene faves. SPAZ: In 1997, you released the amazing Drawn To The Deep End. Do you remember much about the recording of the album? Did the band feel pressure to follow-up a successful debut? MATT: Martin was ill through some of it which often gives us slightly confused negative memories of it... but some of our best work is on that LP. “Speak To Me Someone,” “Where Are They Now,” “Kings,” “Why I Was Born”... but “New Amusements,” “I Love You What Are You” not so much. It was four songs short of being a total all-time classic IMO. But the high points are very high indeed and those tracks will no doubt endure. We were under a lot of pressure from Polydor to make a worldwide huge selling LP and we gave it our best shot. No harm in reaching for the top... But in hindsight, I think we needed to do that with the third LP and tried to make too much of a jump. That's the music biz though - they don't want to develop, they want the dosh right here, right now! I honestly think Gene could have been a much larger band if we had attempted smaller gains at this point. But we still did good. SPAZ: Again, you had a plethora of great non-album tracks. With your busy touring and promoting schedule, how did you find the inspiration and time to come up with so many quality tracks? 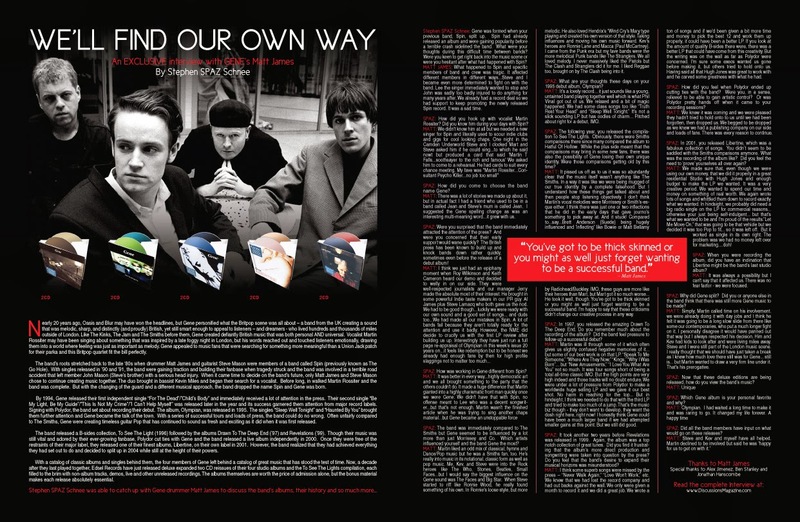 MATT: We didn't have that many actually for Drawn… That's why there are a lot of covers on the b-sides. We used all our best stuff for Olympain and To See The Lights and went on tour solidly for years. I didn't go home for months and we found it hard to write on the road. SPAZ: How do you view Drawn To The Deep End now? SPAZ: It took another two years before Revelations was released in 1999. Again, the album was a top notch collection of great tunes. Did you find it frustrating that the album’s more direct production and songwriting were taken into question by the press? Do you feel that the band’s desire to expand their musical horizons was misunderstood? MATT: I think some superb songs were missed by the press – “Never Walk Again,” “Love Won't Work,” etc. We knew that we had lost the record company and had out backs against the wall. We only were given a month to record it and we did a great job. We wrote a ton of songs and if we'd been given a bit more time and money to pick the best 12 and work them up properly, it could have been a better LP. If you look at the amount of quality B-sides there were, there was a better LP that could have come from this creativity. But the writing was on the wall as far as Polydor were concerned. I'm sure some execs wanted us gone before making it, but others tried to hold onto us. Having said all that Hugh Jones was great to work with and he carved some greatness with what he had. SPAZ: When looking back at Revelations, even though the album is a stunner, do you feel that the band should have perhaps made a more gradual change, musically? Maybe an album or EP that signaled this new approach? MATT: Possibly... but it wasn't an option. They gave us an EP budget for a whole LP. SPAZ: In the end, do you think that the press over-reacted? I mean, the album is still distinctly Gene…. MATT: The press just run out a zeitgeist line, not a truly objective one. That's just the way it goes. We weren't young and new anymore and I honestly don't think what the record actually sounded like made any difference to the review. We're all guilty of this from time to time. I was a massive REM fan from the very beginning but just got irrationally bored of them in the later years. They were probably still good but I wasn't listening! Crucially, decisions were made to give our LP to non-Gene fans to review. That's hard to fight against. SPAZ: How did you feel when Polydor ended up cutting ties with the band? Were you, in a sense, relieved to be able to gain artistic control? Or was Polydor pretty hands off when it came to your recording sessions? MATT: We knew it was coming and we were pleased they hadn't tried to hold onto to us until we had been forgotten, then dropped us. We begged to be dropped as we knew we had a publishing company on our side and loads of fans. There was every reason to continue. SPAZ: While it’s not part of the new reissue series, you released a live album called Rising For The Sunset in 2000. Why did you choose to release a live album as your first post-Polydor album? MATT: We got quite excited about doing a live stream on the internet... a very revolutionary thing at the time. I must say it's a very good live LP. We were given a decent advance for it too by Snapper Records which was very welcome and kept our wages going. We were able to save money for our own label release. We were still very much in the fight. SPAZ: Are you happy with Rising For The Sunset? MATT: Yep. Our live sound guy Snake was a real talent and he helped a lot. He's a very highly demanded live engineer these days... stadium acts. SPAZ: You started your own label and began recording the album Libertine. In the meantime, Universal released a ‘best of’ collection entitled As Good As It Gets. Was this a contractual obligation release or was it put together without your consent? MATT: They were showing that they could now do what they liked with our stuff… they still can (apart from Libertine). We weren't involved in this. It's obviously got no Gene love about it. SPAZ: In 2001, you released Libertine, which was a fabulous collection of songs. You didn’t seem to be saddled with the Smiths comparisons anymore. What was the recording of the album like? Did you feel the need to ‘prove’ yourselves all over again? MATT: We made sure that, even though we were using our own money, that we did it properly in a great residential Studio with Hugh Jones and enough budget to make the LP we wanted. It was a very creative period. We wanted to spend our time and money on something of real worth. We again wrote lots of songs and whittled them down to record exactly what we wanted. In hindsight, we probably did need a big radio single on the LP for commercial reasons... otherwise your just being self-indulgent... but that's what we wanted to be and I'm proud of the results.”Let Me Move On,” that was going to be that vehicle but we decided it was too Pop to fit... so it was left off. But it worked as single in its own right. The problem was we had no money left over for marketing.. .doh! SPAZ: When you were recording the album, did you have an inclination that Libertine might be the band’s last studio album? MATT: It was always a possibility but I can't say that it affected us. There was no fear factor - we were focused. SPAZ: Looking back on Libertine and everything that brought you to that point, would you have changed anything along the way? MATT: I think “I Can't Help Myself,” “For The Dead,” and “Be My Light, Be My Guide” deserved to be on Olympian. They are probably better songs than “Haunted By You,” “To The City,” and “Left Handed”... But I've explained why we didn't do that. If I had been manager, I would have put the breaks on Drawn To The Deep End with Chris Hughes (producer and former Ant) and made a bridging LP. We should have worked with him later - if allowed to. The LP cost too much and put a huge debt on our shoulders we didn't have to put there. But there was pressure that 'this was out time' and I do see that argument. Polydor obviously weren't deliberately trying to mess up our development. But the rest of our career panned out they way it did because of those early decisions. SPAZ: Why did Gene split? Did you or anyone else in the band think that there was still more Gene music to be made? MATT: Simply, Martin called time on his involvement. we were already doing it with day jobs and I think he felt it was going to be a long slow slide from there like some our contemporaries, who put a much longer fight on it. I personally disagree it would have panned out that way but I always respected his decision. Him and Kev had kids to look after and were living miles away. Steve and I were still part of the London music scene. I really thought that we should have just taken a break as I knew how much love there still was for Gene... still is... but Martin wanted to draw a very firm line under it. That's his prerogative. SPAZ: Now that these deluxe editions are being released, how do you view the band’s music? SPAZ: Which Gene album is your personal favorite and why? SPAZ: Is there an album in the catalog that you may not have felt that strongly about but now seems a lot better due to the bonus material? MATT: Maybe Revelations... but Libertine is the best 'value' of these re-issues - it's the only one we have control of adding anything to. SPAZ: Did all the band members have input on what would go on these releases? SPAZ: Any chance of an official Gene reunion to coincide with these reissues?